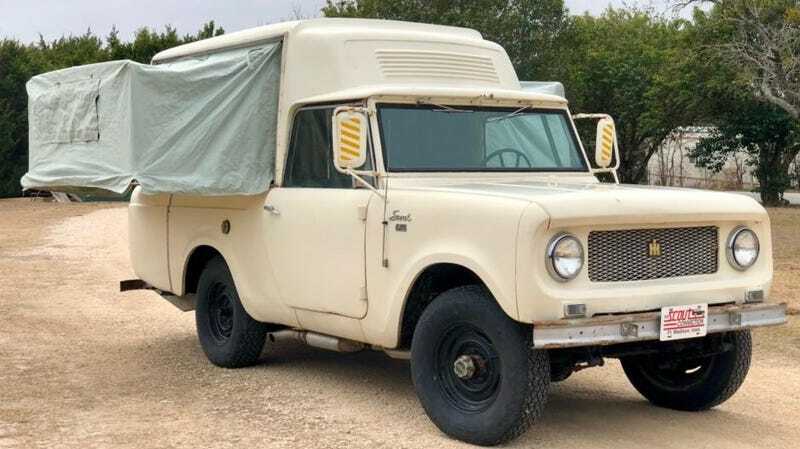 With an International-Harvester Scout like this Winner Boats-built Camper model, you’re free to live out your hipster overlanding fantasies in something distinct and unique. If you’re the winning bidder on this Bring A Trailer auction, you can go see the world. You can live in WalMart parking lots and KOA campgrounds all over this great nation. Head down Mexico way and spend a few days exploring oceanside beaches. Adventure north to the Arctic circle just because you can. This is the kind of truck Instagram accounts are made of, its look inspires a human to do stupid and incredible things. If you’ve got a modicum of mechanical aptitude, this tractor of a truck should take you basically anywhere you, a passenger, and all your stuff would want to go. You know, once you’ve given it a full going-through. Does your car have a toilet? This one does. As can clearly be seen, it’s fitted with a fiberglass rear camper shell. That shell adds a little more than three feet to the rear of a standard I-H Scout, but the versatility provided more than makes up for the lackluster departure angle. In the back there, you’ve got two side-mounted fold-out beds, a small New York-style kitchen, a tiny two-person dining table, and a hide-a-way toilet. Apparently, the kitchen’s fully-kitted option pack, including sink, icebox, oven, and stove, is quite rare even among the already-rare Scout-based camper. A driving experience doesn’t get much simpler than the Scout. With just 93 horsepower and 143 lb-ft of torque, the International 4-cylinder isn’t exactly an inspiring mill, and it’s mated to a three-speed manual transmission. It must be able to cruise reasonably well, as it’s racked up almost 70,000 miles on the odometer. I just wouldn’t expect to get anywhere particularly quickly. Take your time, enjoy the scenery, and stop often to sample the local flavor. With power transferred to the ground through offset Spicer 27A front and 44 rear axles and a Spicer 18 dual-range transfer case, this truck should go most places you’d want to. Deserts are no problem, hills and dales likewise, but you probably won’t be crawling over many rocks, or bouncing down steep trails. It is 55 year-old equipment, after all. Speaking of equipment, most of the stuff on this truck seems to be in working order. All of the kitchen and toilet accouterments are functional, with the exception of a 12v outlet. The engine leaks, the axles leak, the clutch master leaks. A few U-joints are busted, and it needs a bit of careful re-wiring in the engine compartment. There is a bit of rust underneath the rubber floor mat. All of that said, it does run and drive. The seller advises that the eventual buyer actually bring a trailer to pick it up, but where’s the adventure in that? Bring a few spares, fly in, and drive it home. What are ya, silly? At the moment, this truck doesn’t have many eager bidders, but there is plenty of time for the auction to gain some steam. If you can bid a bargain with this one, you could have an off roading camper with classic good looks for a fraction of the price of a Quigley 4x4 or a Volkswagen Syncro. At $15,500, Does This High-Riding 1984 Subaru Brat GL Lift Your Spirits?